In less than 24 hours, we were due to film a prince and some whales, but there was one problem. The wind was picking up and the sea had become so choppy that it was impossible to see the blow of a whale. It was the afternoon of the 16th June 2017 and we were on board The Pelagos, heading back from the high seas to take shelter over night off the coast of Nice in France, before heading back out the next day to meet Prince Albert II of Monaco. 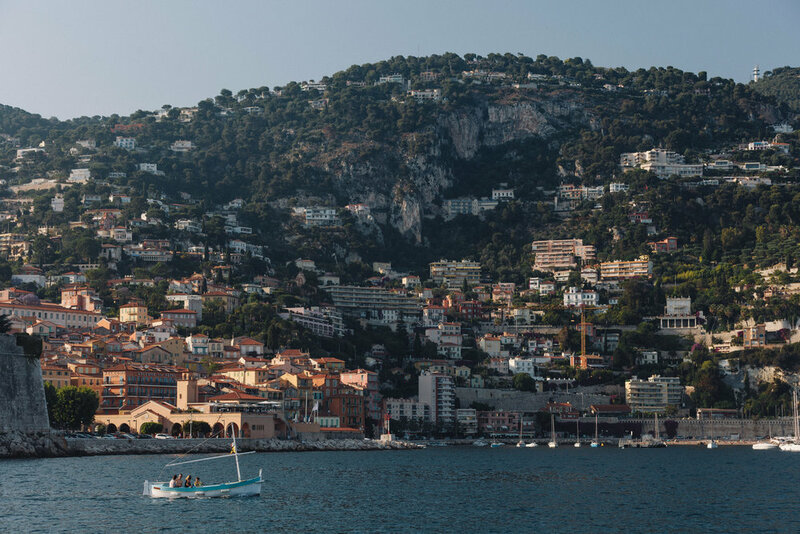 Later that night, we stayed in a small bay off the coast of Nice, France. We were going to meet His Royal Highness out on the high seas, and we hoped to film the Prince getting a chance to see the whales his family helped to save long ago, when his father took steps to work with Italy and France to set up a sanctuary to protect these whales. (We would film him with Italian marine scientist Giuseppe Notarbartolo di Sciara, who prompted the whole initiative). We had spent time getting a gist of the protocol when it came to filming with Prince Albert II at the United Nations a week earlier and had a number of meetings with all the stakeholders involved, but being out to sea was different. Without office walls and suits, nature tends to strip us all of those human formalities we have grown accustomed to, especially when we are on the search for wild creatures. Only the day before, 16th June 2017, the sea was calm: it was easy spot whales. We were used to filming people out on the water, who are divers, scientists, fishermen and tour operators. Often their hair was wild and wet. They were covered in zinc, or just let their skin burn crimson under the sun. They did not care what they looked like. Their attention was directed towards the sea and all the creatures that lay within it. The sea was their life. I knew the Prince loved the ocean too, so I wondered if perhaps we would connect with him in the same way we have connected with all of these other salt of the ocean people whom we had met over the years. The better the connection, the easier it would be to share his story. I knew, however, that we did not have much time to interview him and get to know him. Filming tomorrow would be a challenge. James also needed to get some good action sequences to tell the story of the Prince, the marine scientist and the whales. We really hoped the Prince would get to see his whale. The Prince's most senior advisors had told us repeatedly that the Prince was lucky, and that he would get to see a whale. I wanted to believe this, so I spent hours up on the bridge trying my best to spot a whale in the chop, hoping that these giants of the sea would follow us, just stay with us overnight, and would be there tomorrow for the Prince. So, I sat there stubbornly with a pair of binoculars refusing to admit to myself that our good fortune from the day before might be over. Our fate was intrinsically tied to the elements of the sea. That intuitive feeling that something extraordinary was about to happen was still there, but it felt a little less persistent. The day before, we had a magical encounter with the fin whales of the Pelagos Sanctuary - see 'Chasing Giants in the Blue - Part 2'. While Co-Director, James Sherwood, had secured his epic underwater shot of a mother and a calf yesterday, which was a true relief, we still had one more filming mission to fulfill - and we had just a couple of hours to get it right tomorrow morning. I knew that as we travelled closer and closer to shore, there was less and less chance of seeing another whale today. 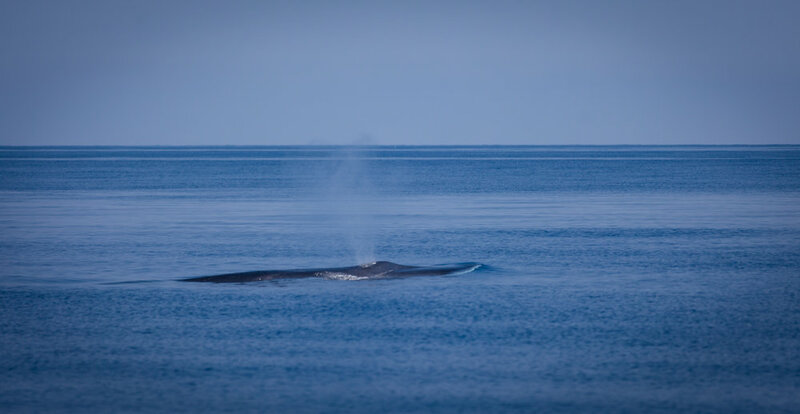 The reason why we had travelled so far out to sea in the first place is because fin whales tend to roam the depths of offshore waters of the shelf and beyond. In the Pelagos Sanctuary, they roam the deep waters down to 1,000 metres below the surface - not on the shore line where we were headed. I just hoped that somehow tomorrow, when we returned out to the high sea, that this ‘intuitive feeling’ would still remain and grow strong, again. Otherwise, we might find ourselves without a story. That night I had a terrible sleep. The next morning I woke up with a twisted feeling in my gut. The big day had finally arrived. I had been dreaming about weather (sun and rain) for the past eight months, and then on the morning of this big day, it happened - the sun suddenly decided to come out. We were up at dawn. The weather was beautiful. The sea had settled back to a glassy pool, a deep blue metallic glow. Our boat cut through the picturesque morning like a bird on a breeze. Once again, we were heading back out to sea to chase whales in the giant blue. It felt good to feel the salt in the air. A nearby boat radioed the captain of our boat to let us know they had spotted whales, so we headed towards where we had been told to go. Everything was going really well. Just splendid. We saw many striped dolphins the day before. Our captain tried to radio the Prince’s boat, as it was nearly 8:30AM. It was time to meet the Prince. We waited, and we waited. The time was nearing 9AM. I kept looking out to sea. I kept anticipating a radio call. My heart raced. The sea might change again at any minute and become choppy again. Or, what happened if the whales disappeared deep into the blue, never to return? Had I just dreamt all of this? Were we really out on the high seas waiting for a prince? Before us, the whales were putting on a show, but the Prince was nowhere to be seen. Then, at last, we saw two speed boats come into our view. They were speeding towards us. Monaco's Police boat out in the Pelagos Sanctuary, Mediterranean Sea: the conditions of the sea turned again to glass on the morning we met Prince Albert II of Monaco. This is when panic began to set in - we discovered via a radio call that the two speed boats indeed belonged to the Prince's entourage and the whales were in such good spirits this day that they had already shown up alongside Prince Albert II of Monaco’s speed boat just as they were journeying out to meet us. The whales were putting on a performance for the lucky Prince and the camera crew who had escorted him. (We were slightly envious of the cameraman at that moment as he was getting the exact shots we had been yearning for now for eight months). At least, the Prince was enjoying seeing the whales he had come to see. It was just as predicted by the Prince’s most loyal advisers - the prince had seen his whales. Perhaps, mother ocean was displaying her gratitude for his family's kindness to her. There was only one slight problem with this glorious day of good weather and a hyperactive display of nature; we weren’t filming the action - the very reason for arranging this whole mission out on the high sea. We were trapped on a boat with a great big sea between the Prince and us, and we had no choice but to wait until his boats were ready to simply turn up. It felt like a long wait. (Sometimes, it is hard to just step back and allow events to unfold organically). Would these fin whales swimming by our vessel stay around, or vanish quickly into the deep blue? Prince Albert II of Monaco approaches the research vessel we are on named 'The Pelagos'. Eventually, the distant speed boats picked up their pace and arrived by our boat - one was a giant zodiac with an entourage of notable people dressed in white and red uniform, followed by a slightly smaller red zodiac, which was clearly a police boat as there were a handful of men dressed in black. I could see that the Prince was wearing the down-to-earth colour of khaki. It suited the scene - a stark contrast to the formal attire of the black suit that he wore at the United Nations where we first met him just over a week ago. He arrived with marine scientist, Giuseppe Notarbartolo di Sciara, who boarded the boat with a somewhat relieved-looking smile. The Prince had timed his arrival perfectly well - the hump of a fin whale appeared as if just on cue. (In his interview later on, Italian marine scientist Giuseppe Notarbartolo di Sciara said it was just as if the God Poseidon had decided to grant us good weather. Like us, he had been worrying over the conditions of the sea for months - wondering what the sky, the Gods, had in store for us ever since this date with His Serene Highness of Monaco had been arranged). Co-Director, James Sherwood, films Prince Albert II of Monaco and Italian marine scientist Giuseppe Notarbartolo di Sciara. They are very happy, because they just saw a fin whale very close to their zodiac vessel. After eight months of wondering what this day would bring, we would film that ‘wishful’ shot of the Prince looking out at a whale and, when I sat down with him for his interview, it struck me that this man of royal blood might have been a very good marine scientist in another life. He is clearly addicted to the Mediterranean blue (just as much as James or Giuseppe was), and there was excitement and a gentle softness in his voice when he spoke of nature and science. It was, however, one of the more difficult interviews that I have done, simply because I knew that we were so restricted by time. There was pressure to cut it short and I could feel that the world was watching. I tried as best as I could, in a short amount of time, to work with the Prince so that he might share some insight into who he and his family are, and why they are so conservation-minded in a world where many leaders are not. His khaki attire sat comfortably on him and, when he looked out to admire the hump of a giant emerging from the blue, he seemed not to be bothered at all that he was accompanied by so many people watching every move that he made. Italian marine scientist Giuseppe Notarbartolo di Sciara and Prince Albert II of Monaco out on the Pelagos Sanctuary, celebrating this special area that they have helped to protect and safe guard over the years. Like the gentle creature before us just doing its own thing, the Prince was being watched, but his mind was focused on the second largest creature on Earth and the big blue sea - a soothing place where anyone would rather be. I tried to imagine what it might be like for Prince Albert II of Monaco with all the heavy responsibilities of duty he carries - after all, he was here filming at 8:30AM on a Saturday morning. (It did occur to me that his effort to come out here today was excellent proof of his commitment to saving the ocean; he could have been anywhere, with his family, at home. Maybe he was here with us, because he understood that every bit of education and outreach counts - helping to save the world for his children and all the generations to come). Whatever the reasons that brought the Prince here today, I came to the conclusion that Prince Albert II of Monaco was a person who understands the importance of keeping places wild. I can imagine that nature must be an escape for him; an opportunity to connect with what is real and, because he does not have a true chance of roaming freely within it, it makes sense that he wants to protect such an ideal. It makes sense that the open sea is a paradise to him. A fin whale blow in the open ocean, Pelagos Sanctuary, Mediterranean Sea. I do wish we could have had a chance to explore Prince Albert II’s connection to the wild more in-depth, (but that is the mind of a documentary-maker). I always want to explore things further. I could go on filming forever, if it were possible. This is why a long-form feature format of a documentary suits my personality just fine. So, this is where our story with the Prince ends. We left The Pelagos out in the middle of the ocean, hopping off the research vessel (which we had spent three sleepless nights on) and onto the red police zodiac boat, which was powered by a number of giant engines - and we left the high sea, speeding back to shore as quick as lightning. It was like taking a journey on a rocket into space - something you don’t do everyday. We don't often take 'selfies', but this time we could not resist. We don't often post 'selfies', but we couldn't resist. Co-director James Sherwood & Danielle Ryan with the Monaco Police. Back on shore, we marvelled at the fact that we had gotten all the impossible shots we were after. The adventure of the past few days was truly wondrous, so we had a glass of celebratory wine, then realised our mission was far from over - we still needed to get the media we had just filmed home safely, so we could finish The Map to Paradise edit! Maybe in just a few days, we might be able to finally sleep.